The World Peace Prize Ceremony is being held in the Gold Room of the Capitol of the United States today. The award presentation honors Top Honor Prize recipients H.H. Dorje Chang Buddha III and Hon. Benjamin A. Gilman; and Roving Ambassador for Peace will be awarded to the Civil Air Patrol. The ceremony is attended by members of Congress and international dignitaries. World Peace Prize is an initiative to promote worldpeace and understanding between different nations, ethnicities, cultures and religions. The WorldPeace Prize is a prestigious award presented by the World Peace Corps Mission, an international Evangelical missionary organization founded by Hon. Robert Leggett and Dr. Han Min Su. Since its establishment in 1989, the World Peace Prize has been awarded to individuals contributing to the causes of world peace by preventing regional conflicts or world war; by settling the disputes of political, diplomatic and economic matters; and by developing new inventions to minimize threats and confusions within mankind. The World Peace Prize Awarding Council operates according to the core spirit of advancing peace and justice and inter-religious collaborations. Past recipients include President Ronald Reagan of the United States, President Abdurrahman Wahid of Indonesia, and President Kuniwo Nakamura of Palau; amongst others. Since its inception, World Peace Prize celebration has always been held in the recipient’s country of residence. Breaking precedence, the award presentation is being held here in the Capitol of the United States. H.H. DORJE CHANG BUDDHA III, recognized by the WorldPeace Prize Awarding Council for his selfless devotion to an immensely wide scope of healing and rescue-relief activities directed at people from different communities throughout the world. His wisdom and benevolence embrace all races, ethnicities, cultures and religions: bringing kindness, peace and equality to all. Wherever he goes, His Holiness brings unity amongst people through his own humility and compassion. His continual contributions to humanity have proven to be a living example of the benevolent spirit of Buddha, setting a model of humanitarian practices for all to emulate. His Holiness is also a distinguished artist. Through his teachings and practices, art and poetry, H.H. Dorje Chang Buddha III has pointed out a bright path of non-violence, charity and love for humanity. 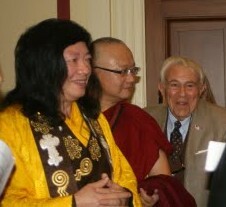 His Holiness has been the recipient of numerous awards including the United States Presidential Gold Award for his outstanding contributions to arts, medicine, ethics, Buddhism and spiritual leadership, and to American society. H.H. 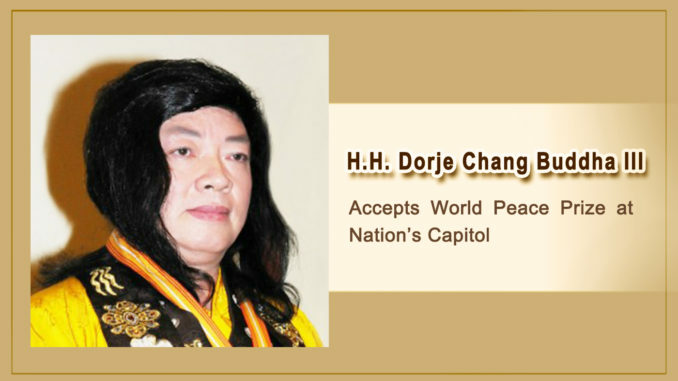 Dorje Chang Buddha III is the first Buddhist leader to be awarded the World Peace Prize in the organization’s 20 years history. HON BENJAMIN A. GILMAN, recognized by the World Peace Prize Awarding Council for being a life-long champion of human rights: fighting world hunger, narcotic abuse and trafficking. He has made many successful efforts to bring about “prisoner exchanges” which resulted in freedom of American citizens in East Germany, Mozambique, Cuba and several other nations. Congressman Gilman served 15 terms (30 years) in the U.S. Congress. Prior to that, he served 6 years in the New York State Legislature as Assemblyman, and several years as Assistant Attorney General in the New York State Department of Law. While in Congress, he has served as Chairman of the House Foreign Affairs Committee and as Congressional delegate to the United Nations with title of Ambassador, and later the Ukrainian Famine Commission and Vice Chairman of the committee on POW’s. Mr. Gilman has been the recipients of numerous honors including the President’s Certificate of Outstanding Achievement “for continued, demonstrated vision, initiative, and leadership in the effort to achieve a world without hunger” and has annually received the “Peace Through Strength” Award presented by the American Security Council. Roving Ambassador of Peace is awarded to individuals or group who are guardians of Peace. Today, the award is presented to the Civil Air Patrol. CIVIL AIR PATROL makes a huge impact going above and beyond to make a profound difference in America’s communities; saving lives and preserving liberty for all. Civil Air Patrol, the official auxiliary of the U.S. Air Force, is a nonprofit organization with more than 61,000 members nationwide. CAP, in its Air Force auxiliary role, performs 90 percent of continental U.S. inland search and rescue missions as tasked by the Air Force Rescue Coordination Center and was credited by the AFRCC with saving 113 lives in fiscal year 2010. They are generally the first on the scene transmitting satellite digital images of the damage within seconds around the world and providing disaster relief and emergency services following natural and manmade disasters, including such phenomena as 9/11, Hurricane Katrina, Texas and Oklahoma wildfires, tornadoes in the south and central U.S., North Dakota flash flooding and the October 2006 earthquake in Hawaii, as well as humanitarian missions along the U.S. and Mexican border. Civil Air Patrol has been performing missions for America for 69 years.